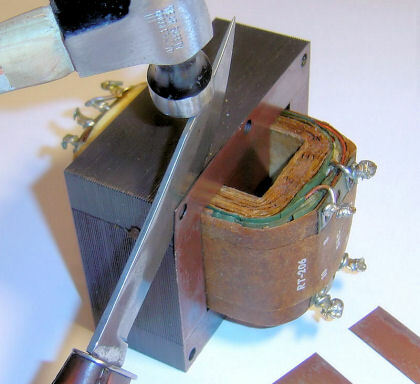 The iron laminations were taken from a surplus transformer. Where did the transformer come from? How do you open a transformer? The device under test was the largest such item found in the local surplus electronics shops. This photo shows the transformer as disassembly begins. Finally, this image shows the pieces after the transformer is fully taken apart.